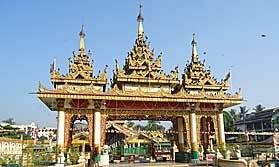 The resort is at the foot of Mandalay Hill, with views over the golden pagodas for which this city is well known. There's a range of rooms and suites, all featuring the mod cons you'd expect of a high quality hotel: air conditioning, TV, international dial phone, WiFi, tea and coffee maker, minibar, safe, en-suite bathroom with toiletries and bathrobe. Suites tend to be more lavish in decor and have a lounge and balcony. There is also accommodation in two bungalows at the Mandalar Spa. There are two restaurants, one in the garden where you enjoy tasty barbecues and international cuisine, the other on the first floor which specialises in Chinese food. There's a cafe open from early morning till late at night, for light meals, snacks and drinks, and the Kipling Lounge, a good place to unwind over some tempting tapas, has live music most evenings. When not out exploring the sites, you can relax by the large pool, walk in the gardens, enjoy a game of tennis or a work-out in the gym. Or relax in the beautiful Mandalar Spa which offers an assortment of massages and treatments. "Good central location but pretty average really - rooms were on the small side and the price for dinner was comparatively very expensive. Probably my least favourite of the hotels we stayed in."